Shirts With Random Triangles: University of Michigan Board of Regents turn down request for fireworks after Wolverine home games at Michigan Stadium. 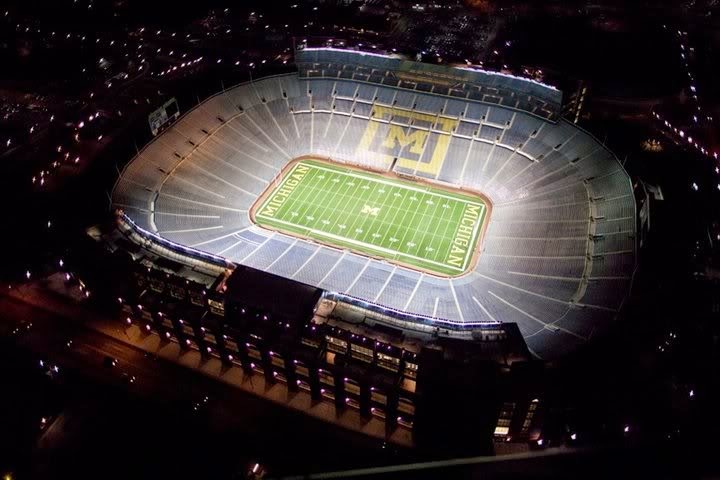 University of Michigan Board of Regents turn down request for fireworks after Wolverine home games at Michigan Stadium. From the "Desperate, But Not Serious" department comes news that the University of Michigan Board of Regents has turned down the Michigan athletic department's latest scheme to solve the dwindling attendance of Wolverine home football games - fireworks. The Michigan athletic department had submitted a request to the Board of Regents to hold fireworks shows following the Wolverines home games against Miami (Ohio) on Sept. 13, and Penn State on Oct. 11. The athletic dept. apparently felt this was the best way to lure Michigan Men and Women back to Michigan Stadium. The Board of Regents shot down the idea on Thursday. Regent Mark Bernstein was apparently not amused by the fireworks request. “We are not Comerica Park, Disney World or a circus ... ” Bernstein said. “I love Michigan football for what it is ... and for what it is not. It remains and should be an experience, a place that resists the excesses of our culture; intentionally simple. For the record, Michigan Stadium had seen fireworks shows back in 2010. Once following the Wolverines' 2010 home opener against UConn, when the Big House was rededicated following renovations. Fireworks were also set off for the 2010 "Big Chill" hockey game between Michigan ans Michigan State faculty members. So it's back to the drawing board for Michigan athletic director Dave Brandon to solve the football game attendance issues. Perhaps winning a few more relevant football games (i.e. Michigan State and Ohio State) would help.